Antelope Canyon is an incredibly popular destination for photographers, artists, and tourists. People come from all around the world to see this slot canyon. From above, the canyon appears to be nothing more than a crack in the ground. But go inside and you will find spectacular and otherworldly beauty. Antelope Canyon actually consists of two canyons: Upper and Lower Antelope Canyon. 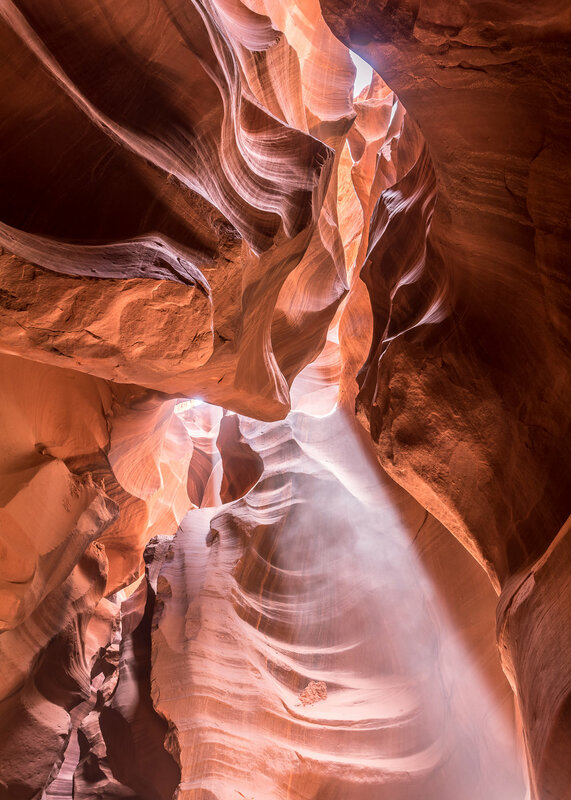 Upper Antelope Canyon is famous for it's light beams. These are visible on sunny days during midday in summer months. Lower Antelope Canyon is also incredibly beautiful but has less prominent light beams. Since I was visiting Page during the summer, I wanted to visit the upper canyon in order to capture the light beams. I read a number of articles beforehand in preparation. It become clear that it would be extremely crowded. The only way to see the canyons is by signing up for a group tour. The "regular" tours don't permit tripods. However, some vendors offered "photography tours" that advertised smaller groups, permitted tripods, and offered longer tours. This was clearly ideal for me. A soft light beam in Upper Antelope Canyon, Page, AZ. Even though I was planning a month in advance, the photography tours were almost all booked (it didn't help that I was visiting Memorial Day weekend). The only photography tour still available was offered through Antelope Slot Canyon Tours by Chief Tsosie. I booked it. No lens changes. It's extremely dusty in the canyon. Changing lenses will wreak havoc on your camera. This is a great time to have a weather-sealed body and lens. Bring a wide-zoom but not ultra-wide zoom. You are packed in really tightly together during the shoot. With an ultra-wide, you risk getting other people and/or their gear in the edges of your shot. With that said, if you somehow managed to get in there without a group, an ultra-wide might be a great option. Shoot ISO 200. Although I typically prefer base ISO (ISO 100 for me), this was good advice. As I explain later, time was a serious factor in most of these shots and cutting the shutter time in half was very useful. No polarizers. I followed this advice in order to shave off time in terms of shutter speed and setup. However, I still think a polarizer might have been beneficial on some of the images. Antelope Canyon is famous for it's colors but that doesn't mean you have to keep them. In fact, one of the most expensive photographs ever was taken in Antelope Canyon and shot or processed as a black and white. I think this duo-tone flavor better accentuates the geometry of the canyon wall in this image. Both images were created from a 3-shot HDR-merge. This scene was actually within the dynamic range of my sensor but the shadows are noticeably cleaner in the HDR version than the nominal exposure. There are no backpacks allowed in the upper canyon. Our guide instructed us to be tripod-mounted and ready to go as soon as we arrived. He wasn't kidding: we jumped out of the car and immediately rushed to the entrance. Prominent light beam in Upper Antelope Canyon. The guides actually throw sand into the beams to make them more prominent. It's best to time the exposure for these events. Once in the canyon, our routine typically followed a common pattern. The narrow canyon is extremely crowded. We would walk to a location and wait for a tour group to exit into the next section. At this time, our guide would set a timer for 2 minutes. Our group would pack into a designated spot in two rows with the top row shooting over the heads of the bottom row (i.e. bad if you are shooting ultra-wide). During the 2 minutes, he tried his best to keep people from walking into our shots. 2 minutes is not a lot of time to set up a tripod-mounted shot, set exposure, and compose in this tight and complex environment. You need to be intimately familiar with your gear. I shot with a cable release and a Manfrotto 804RC2 head. Although I generally prefer pan-tilt heads, I think that I would have been better served with a ball head to decrease setup time. Don't worry about perfectly leveling each shot, just get it close, shoot a little wider than you really want, and crop later. Another problem I had with the head was that it didn't tilt enough to let me shoot the ceiling. My field-fix was to rotate the quick-release plate connection such that I could tilt higher than I normally could. But this wasted valuable time on a few occasions. I think they call this rock feature the "Abraham Lincoln." 3-shot HDR-merge. All my shots were ISO 200 at f/7.1. I shot manual and adjusted the shutter speed based on the histogram. For many locations I shot with a ±2 stop bracket so that I could merge to HDR. I had mixed results with this. Some of the +2 stop brackets were up to 15 seconds long. This is a long time when you only have 2 minutes per location. In addition, there are issues with ghosting if you try to HDR-merge shots with light beams since the beams are not static. Finally, a -2 bracket still completely failed to capture highlight detail if the sky was visible in the shot. What I would recommend doing instead is to bracket by taking three spot meter readings in aperture-priority mode: one on sky, one in deep shadows, and one on mid-tones. Alternatively, just try to avoid capturing sky in your compositions or accept that it may be blown out. One interesting aspect of this experience is "composing under constraint." Once you and your group get settled into a spot, you have almost no ability to move the tripod. Your control surfaces are limited to the vertical shaft and the head. I have several shots where I wish I could have just moved a few inches to get a better composition. However, in this case, you just have to work with what you have. Since I was typically shooting low (and sitting on the ground) having live-view and a flip-out LCD was invaluable. I don't think there is any way that I could have composed using only the optical viewfinder without some incredible contortions. Shot towards the ceiling in the famous "cathedral room." 3-shot HDR-merge. Overall, I found this shooting experience to be fun and intense. If you come to Upper Antelope Canyon for photography, this is probably the best publicly-available way to capture top-notch images. My group had great camaraderie and we tried hard to accommodate each other so that everyone could get great shots. However, to really get use of out this (expensive) tour, you need to know what you are doing. Despite the astonishing beauty, the limited time and space realities make this a challenging place to shoot. There is also some risk: a cloudy day means no light beams and less intense color/contrast inside the slot canyon (actually, portions of my tour were under cloudy conditions). The hoards of people that come to visit make this experience feel highly commercialized. In addition, it's very difficult to get a truly unique image when you are on scripted group tours. Now that I can check the upper canyon off my bucket list, I will probably visit some of the other less-well-known stunning slot canyons the next time I go to Page. I expect they will yield a more intimate experience and greater potential for unique shots. However, I definitely recommend one of the Antelope canyons if you only have time to go to one.